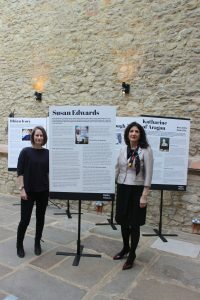 Barrister, human rights lawyer, feminist legal scholar, activist and Professor of Law at the University of Buckingham Susan Edwards features in the Old Gaol Mighty Women exhibition. Her ground-breaking work in law and fight for the rights of marginalised individuals and groups, gives a voice to those who otherwise would go unheard. The free exhibition was researched and composed by previous University of Buckingham staff member Lauren Hutton and focusses on the stories of eight extraordinary women throughout the regions history. It is open Monday to Saturday from 10am to 4pm until April 27. Susan Edwards said: “Women everywhere, at every time, every day and in every way, continue to make a difference. Lauren Hutton’s ‘Mighty Women’ exhibition has creatively drawn together across time, space and place just a sprinkle of some of those women who have contributed to Buckingham and sojourns far beyond. Other women featured range from Katherine of Aragon who had her biggest achievement while staying in Buckingham to Florence Farmborough, who served on the Russian front line as a nurse during World War One and was twice awarded the St George’s Medal for bravery. In more recent times, ground-breaking Carnegie-nominated young adult fiction author Rhian Ivory is featured. The University of Buckingham Bookshop has sourced a selection of empowering books for girls and women and is offering 25% off for the duration of the exhibition. For more information on the exhibition please visit: www.buckinghamoldgaol.org.uk.